The Wallet feature in our mobile app helps you keep track of all the virtual cards that you have in your name including your budget cards as well. The wallet feature will display two different sections for you. Member Cards and Budget Cards. Member Cards are those that are created in the mobile app. These cards are tied directly to the funds that been divvied directly to you. A Budget Card is one that you have created in the web and is directly tied to the budget. This can be either a subscription or burner card. Remember, this does not effect the funds that have been divvied out to you personally. 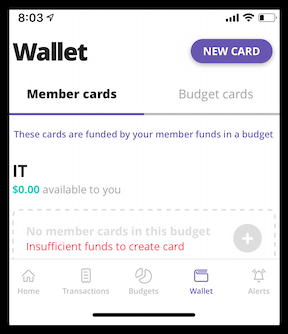 Through the Wallet feature you can view full card numbers, create a new card, and manage the cards you currently have.